This morning I want to talk about angels. Real living angels. This means our guardian angel as well as the great “safety net” of angels that God surrounds us with all the time. This means talking about “fallen” angels who are in Hell. These demons have far more influence on us than we realize. In the natural order it’s possible for anyone to have a reasonable sense of the existence of angels. 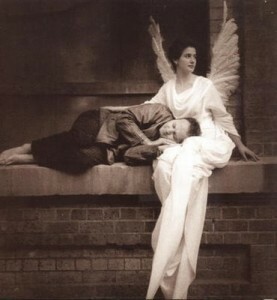 The notion of angels as with spiritual truth itself never defies reason. God created angels as His first act of love long before He formed the earth or created man. With the help of the Bible the reality of angels come into sharp relief showing us how they love and adore God and serve as His messengers and His agents of grace. We see how angels are key players in the divine plan to redeem man from his fallen state and return him home to God. The Bible throws into sharp relief on the reality of fallen angels or demons and reveals their demonic strategy. The first group of angels are the “good” angels. They are pure spirits with intellect and will. They shield us from danger, guide us, comfort us and bring God’s healing graces to us. They are a special comfort in some weakness, illness and at the time of our death. They can influence our moral reasoning and contribute to our spiritual growth. From this heavenly family God chooses one angel to be our “Guardian” angel. Their charge is to stick with us through-out life forging a bond stronger than any natural force or relationship on earth! It’s important for us to know exactly how fallen angels rebel against God because it’s the same way they influence us to rebel against God and one another. As I said, angels are pure spirits with intellect and will. So any “battles” that they wage are primarily battles of the intellect and will. Their “weapons” so to speak are essentially arguments. The primary battle field that these spiritual battles take place on is messing with our intellect and will. These fallen angels go to work in our head and in our heart… to frustrate us and seduce us… to pull us away from our allegiance to the Blood Covenant in Christ and to discourage our adoration and love of God. They are behind the senseless, ignorant controversies and quarrels that we get involved in. St. Paul says that you can tell when a person is falling under the influence of demons because their reasoning becomes obscured and futile, their understanding is darkened, their heart becomes callous and stubborn. This breeds dissension and pull us away from one another, recreates the tower of Babel forging great illusions and confusion in our mind and heart. The end result for such a person if he does not resist the devil and flee is alienation from their family, their friends and neighbor and God. The entire Bible testifies to this belief. Both the Old Testament and the New Testament talk of good and bad angels, it speaks of the fall of the evil spirits due to their free will, and the role of the devil in bringing about the fall of man. For example, in the Old Testament certain angels are given names: Gabriel, who foretold to Daniel the coming of Christ as the “anointed Prince”, and Michael, who was given the task by God of watching and defending all people from the ultimate forces of Satan. We have the lovely story of the angel Raphael who delivered Tobias‘wife Sarah from demons, who then led Tobias through a hazardous journey, and cured Tobias’ father (Tobit) of blindness. In the Gospels, an angel of the Lord appears to Zachariah to foretell the birth of his son, John the Baptist; and Gabriel appeared to the young virgin girl Mary of Nazareth who upon hearing the words of Gabriel received the Word of God in her heart and in her body and she gave Jesus to the world. An angel appeared to Joseph to assure him that the Child his wife now carries in her womb is of a miraculous conception. This same angel leads the Holy Family into Egypt to safety and later tells Joseph of King Herod’s death; and Jesus teaches that He shall return “in His glory and the glory of the Father and of the holy angels;” (Luk 9:26). With these few examples and so many more that could be given we see clearly that angels are a living reality and they are a fundamental component of our Christian faith! The Bible also testifies to the corrosive and destructive work of demons. As I said, demons seduce. Demons divide. We see this clearly in the temptations of Jesus. Each temptation was an effort to seduce Jesus, to work on His intellect and will to drive a wedge between Him and His heavenly Father. The good news is that God prohibits Lucifer and his demons to harm us in a fatal way but He does allow demons certain liberties and these liberties are permitted to test our faith which means our devotion to truth and to what I call moral courage. Though demons are never permitted to temp us beyond our strength, the temptations they manifest will be fierce, very cleaver, and leave lasting impressions upon us, a “stain” from the struggle. St. Paul reminds us of this “…let anyone who thinks that he stands take heed lest he fall. 13 No temptation has overtaken you that is not common to every person. God is faithful, and he will not let you be tempted beyond your strength, and with the temptation will be found the way of escape, that you may be able to endure it.” (1Co 10:12-13). God will provide through His angels sufficient grace to overcome the maneuvers of demons. God will provide grace to help us repent if and when we fail. But we must seek God’s help to recognize evil spirits and use right wisdom to act so we act like Christ to resist advances from demons. This is always easier said than done because demons can use our human “fallen” logic to win us over. “Have nothing to do with foolish, ignorant controversies; you know that they breed quarrels. And the Lord’s servantmust not be quarrelsome but kind to everyone, able to teach, patiently enduring evil, correcting his opponents with gentleness. God may perhaps grant them repentance leading to knowledge of the truth, and they may come to their senses and escape from the snare of the devil, after being captured by him to do his will. But understand this that in the last days there will come times of difficulty. 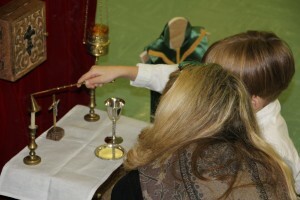 For people will be lovers of self, lovers of money, proud, arrogant, abusive, disobedient to their parents, ungrateful, unholy, heartless, unappeasable, slanderous, without self-control, brutal, haters of the good, treacherous, reckless, swollen with conceit, lovers of pleasure rather than lovers of God, holding the form of religion but denying the power of it. Avoid such people.” 2 Tim 2:23-3:5.